The family room is a great place to spend time with our loved ones, and while we might choose to spend some of that time enjoying movies or games together, those things often aren't the focus of the room. 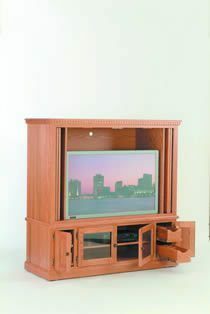 This handcrafted media cabinet brings two pieces of furniture to your space, transforming into a beautiful, functional entertainment center when it's movie time, and then into a subtle storage cabinet when it's time for something a little more traditional. No matter which mode it's in - doors open or closed - the Berlin Classic retains its traditional stature and understated beauty, bringing an air of traditional quality to the home. Every element of this outstanding cabinet is crafted by hand right here in the USA with nothing but the best in home-grown quality and attention to detail. Each surface is sanded and finished by hand, giving the piece an unbelievably smooth and glossy look and feel that machine-made pieces just can't imitate. From its raised feet right up to its perfectly flat, solid top, the Berlin Classic is a study in the art of combining modern convenience with traditional American quality. The menus above showcase all of the options available for your Berlin Classic, including a wide range of native hardwoods and stain choices. If you've any questions at all - or if you'd like to chat about having our woodshops craft a completely custom media cabinet for your home - please don't hesitate to get in touch!